Risk appetite firmed during the late US session on Thursday, following a WSJ report that US Treasury Secretary Mnuchin considered whether to lift the tariffs on Chinese products as a gesture of good faith during the negotiations. Trade-sensitive currencies such as the aussie advanced alongside US stocks, with the S&P 500 (+0.76%) closing decisively above its 50-day moving average; a move that shifts the benchmark’s outlook back to neutral from a technical perspective. Meanwhile, haven assets like the Japanese yen and Swiss franc tumbled. 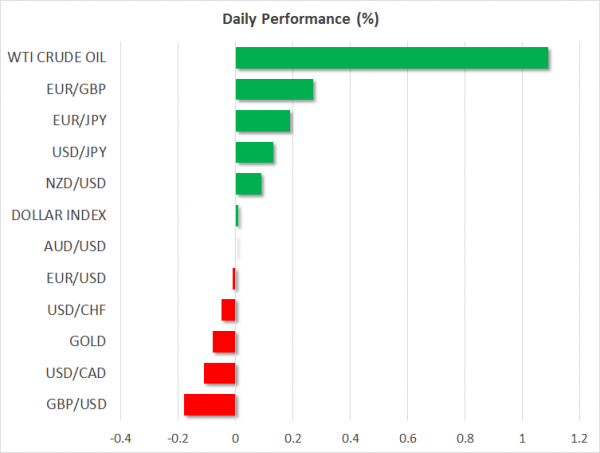 Even though the Treasury quickly denied the report, markets didn’t retrace much, which implies that traders believe the news are credible – or at least that the overall negotiating process is moving in the right direction. Admittedly though, and being skeptical for a moment, Secretary Mnuchin was against the entire tariff ordeal from the very beginning, so it’s questionable whether this story is as significant as the headlines suggest. Going forward, watch for any remarks by Trade Representative Lighthizer, as he is the one handling the negotiations and likely the most important individual on trade matters – outside of Trump himself. The British pound outperformed all its major peers on Thursday, touching a fresh two-month high versus the dollar, even in the absence of any material Brexit developments. Sentiment around the UK currency seems to be turning around rapidly, as investors and pundits alike increasingly digest the fact that a no-deal exit is becoming less and less probable the more Parliament gets involved. That said, there is still no clarity on what the next step is, so while the downside risks for sterling may be dissipating, for the currency to truly explode higher, it may require a clear positive catalyst – for instance an extension of Article 50 or growing consensus for another referendum. UK retail sales will be in focus today, but as always, any piece of Brexit news will probably eclipse any economic data in driving the pound. In terms of economic data, besides the UK retail sales, the highlight today will probably be inflation figures out of Canada. While any surprise in the CPI prints will likely dictate the loonie’s intraday direction, do note that the currency’s broader performance may depend more on how oil prices evolve. After disappearing for most of 2018, the correlation between the two assets – crude and the loonie – has returned “with a vengeance” lately, with the Canadian currency taking its cue from movements in oil. In the US, industrial production for December could attract attention, though in truth, this is usually not a major market mover. Of greater importance, for the dollar at least, may be the preliminary University of Michigan consumer sentiment index for January, as well as remarks by New York Fed President Williams (1405 GMT) and Philadelphia Fed President Harker (1600 GMT). Both are voting FOMC members, so their take on the US economic outlook could prove crucial not only for the greenback, but for broader risk sentiment as well.